One hundred years ago the war featured four of its signature battles: Verdun, Jutland, the Brusilov Offensive, and the Somme. This month on the anniversary of the opening of Operation Judgment at Verdun we are presenting a good amount of information on that battle. I have a few reflections to share on these engagements as a group as we look at their impact long-term. None of them worked out as the initiators hoped, nor as prewar strategists had thought such actions would proceed. The "big breakthrough" proved highly elusive, almost impossible, because of the sheer size of the armies and the breadth and depth of the areas they occupied. Coalition warfare meant that when penetrations were effected, as in the Brusilov operation, reinforcements from allies could be deployed to dampen their effect. At sea, Jutland showed that the day of the battleship as a decisive weapon had passed, although it would take another World War to underline this. We are awaiting the final schedules and details on a number of national and international meetings, seminars, and commemorative events. We will post them here as they become available. 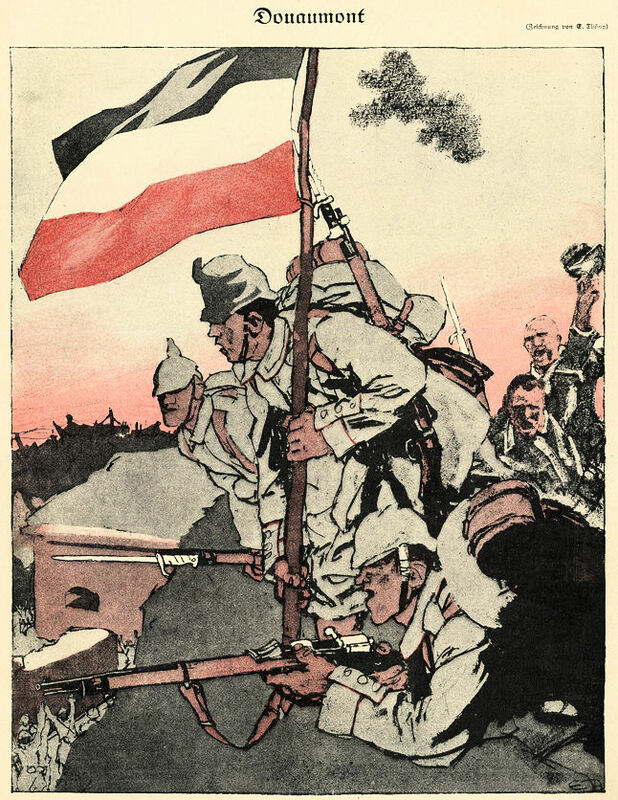 Illustration for home front consumption of the capture of Verdun's Fort Douaumont on 25 February 1916. Considered the world's most powerful fort at the time, its fall was a propaganda victory for the Central Powers. America was not yet a belligerent 100 years ago, but many Yanks found a way to participate in the war. The late-arriving Doughboys were a case in point. After getting to France with their more stylish canvas leggings with leather straps, the infantry of the AEF discovered they simply did not work in the trenches. Mud would seep through and the fabric would start to dissolve. They converted to the British style wool wrappings known as puttees, derived from the Hindi word for bandage. Tricky to wrap, they nevertheless provided better protection against the mud, although they were not problem-free. They did not provide as much protection from minor injuries as the leggings they replaced, and they restricted blood flow, which is not especially healthy. Both sides used puttees in the Great War, however. This woodland fighting has been as bad as anything in this war — most frightful and bloody. 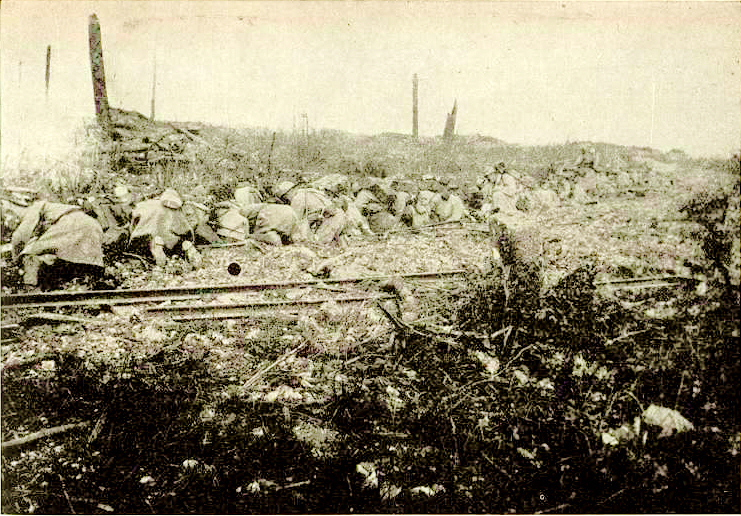 Dead bodies lie strewn beneath the trees, and in the shell-holes are wounded men who have crawled there to die. There is hardly any cover in which men may get shelter from shell-fire. 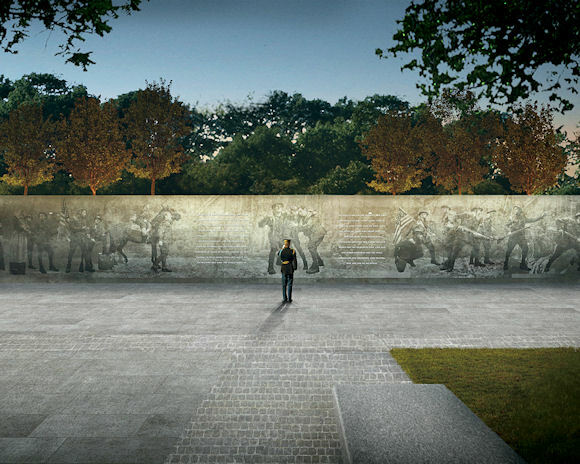 National World War One Memorial! 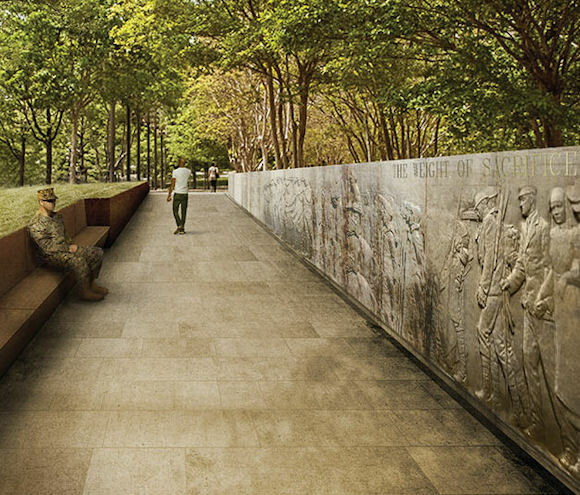 Meet "The Weight of Sacrifice"
"The Weight of Sacrifice," conceived of by lead designer architect Joseph Weishaar of Chicago and his associate, New York sculptor Sabin Howard, has won the international competition for the World War I National Memorial. We will have much more on their design and its progress through the review process, and we will also be sharing with our readers information on how you can contribute to the funding of this great venture. 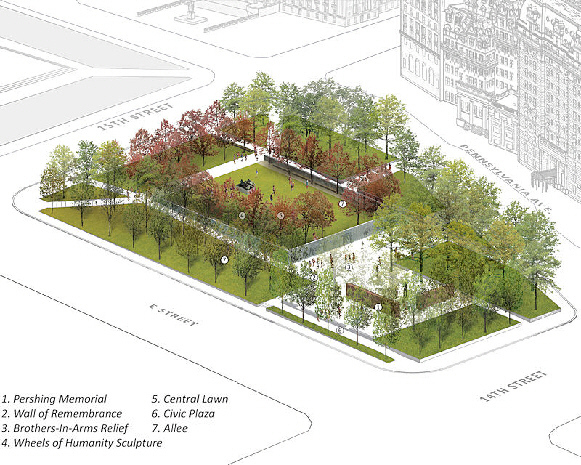 For now, here are some images of the memorial with some comments about what this all means. We were thrilled by the work quality and creativity from all the participants in this competition.  This selected design concept reflects a high level of professional achievement. Today is an important day for me and my family, and it is an important day for our country as we work together to honor the almost five million Americans who served during the Great War. Those five million Americans who served in uniform during World War I literally changed the world. 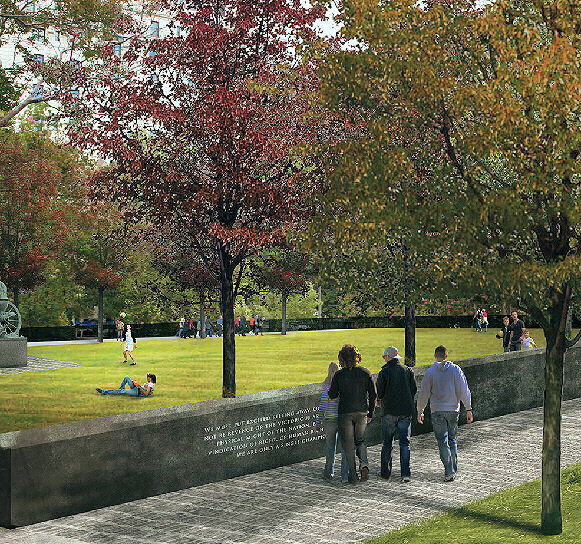 This new landmark in our nation's capital will be a worthy expression of their great legacy. Robert Dalessandro, Chairman, U.S. World War One Centennial Commission. 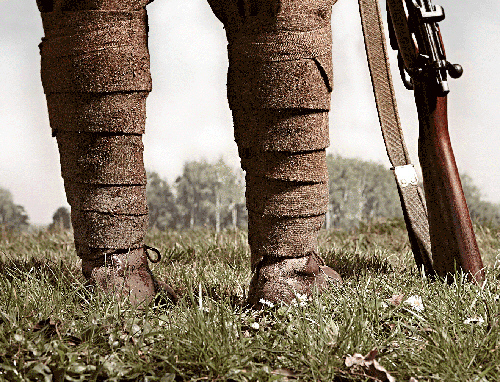 On 21 February 1916 the longest and, arguably, the most famous battle of the Great War began, the Battle of Verdun. 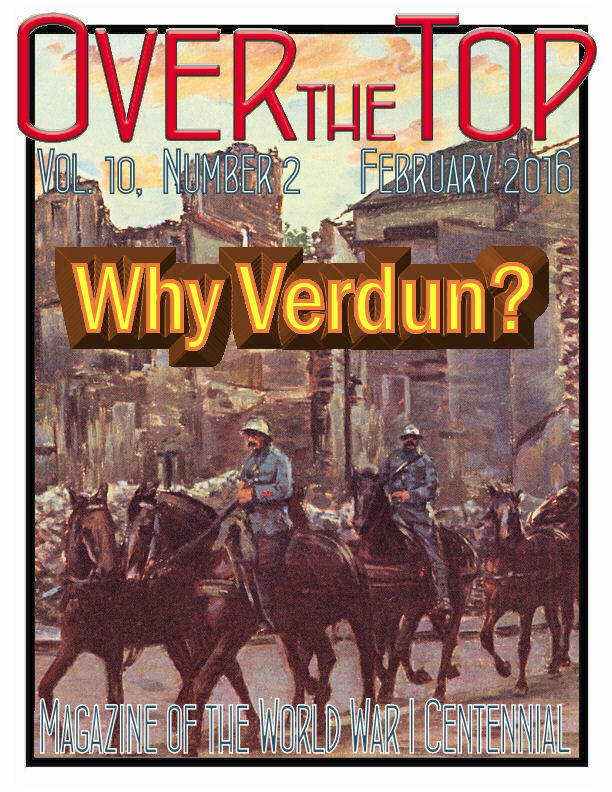 We will be returning to Verdun throughout its Centennial year, but in this issue of the Trip-Wire, I thought a broad overview of the battle was the best introduction for our readers. 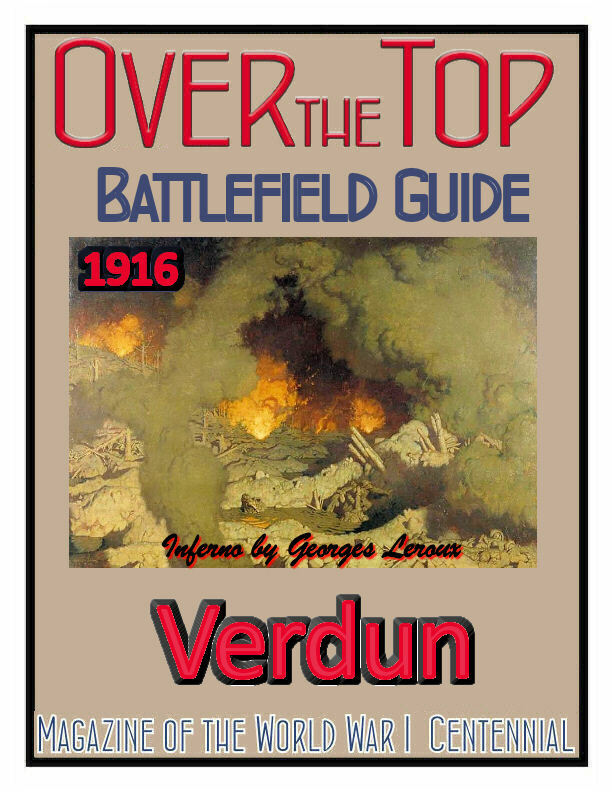 This is adapted from a pamphlet of the National Association of the Battle of Verdun. They describe the 1916 battle in four phases. On 21 February, at 0715 hrs the Germans opened fire on the two banks of the Meuse, over a front of 40 kilometers. 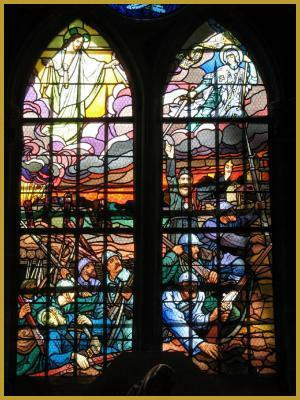 Simultaneously, Verdun proper was systematically bombarded, the first shells falling on the cathedral grounds. Fire was kept up for nine hours, the 1200+ German artillery pieces included a high proportion able to fire heavy caliber shells. The infantry attack was launched at 1615 hrs just before dusk, from the Haumont-Ornes Woods. The first strong resistance they met was from Chasseurs deployed in Bois des Caures commanded by Lt. Col. Emile Driant, who became the first hero of the battle. Over the next few days the terrain and villages between the Bois des Caures and Fort Douaumont were systematically conquered. The fort, which was almost abandoned, fell without resistance on 25 February. General Henri-Philippe Pétain took command over the army of Verdun the same day. To better organize the defenses, he implemented a rotational system for the defending troops and improved the only supply route to the City, the Bar-le-Duc – Verdun road, which came to be known to posterity as the Voie Sacrée or Sacred Way. The German Vth Army expanded their attack to the left (west) bank of the Meuse. The fighting in Bois des Courbeaux and on the slopes of Mort-Homme (Dead Man's Hill) were particularly fierce. On the right bank, mainly the village of Vaux and the forest of the Caillette were contested during this period. The gains of the Germans remained limited. 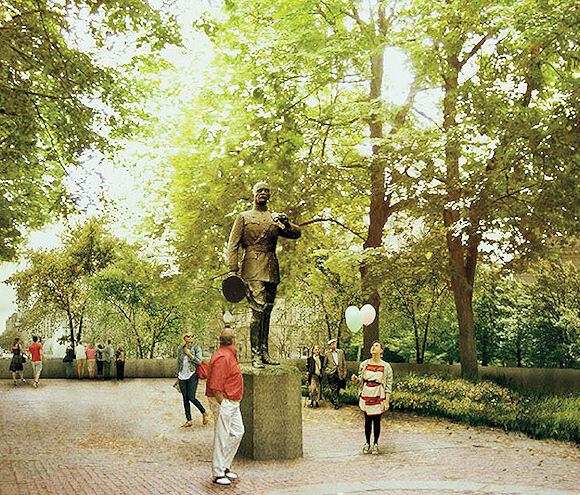 General P�tain declared to his troops, "Courage. . . we will get them!" The enemy continued his advance step-by-step with local actions which were murderous for both sides. On the left bank, Hill 304, Mort-Homme, and the village of Cumières were sites of desperate struggles. General Pétain was replaced by General Nivelle on 15 May. On the right bank, the attempt of General Mangin to take back the Fort Douaumont was a bloody failure (22 May), whereas the Fort Vaux surrendered to the Germans on 7 June after a week's siege. On 23 June, Nivelle, anticipating a German attack issued an Order of the Day which ended with the now-famous line: "Ils ne passeront pas!" (They shall not pass!") Later, 60 000 Germans were sent to the assault at an increasingly narrow front on the right bank to seize the ruins of Thiaumont and Fleury which were subsequently taken and recaptured several times. 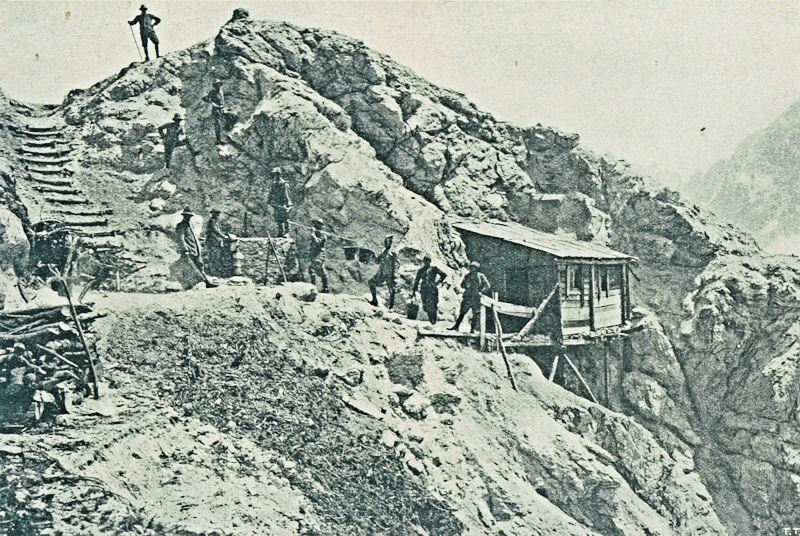 At the fortification known as Froideterre, last obstacle before Verdun, the defenders managed to hold. 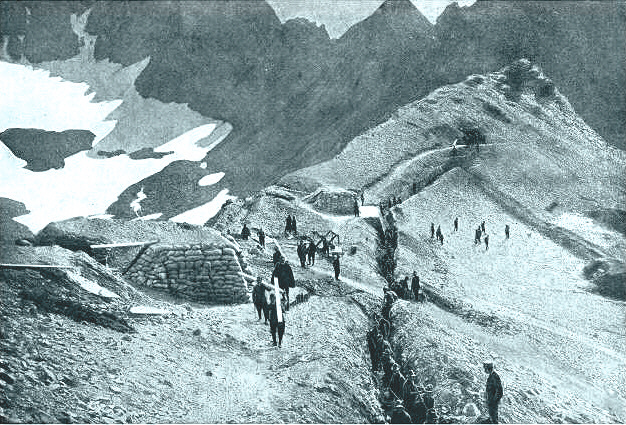 On 11 and 12 July a maximum effort of the German troops pushed to what was their extreme advance: the ravine of the Poudrière (a powder magazine south of Fleury village) and the scarp of Fort Souville. Terribly violent combat followed on the two banks until August. 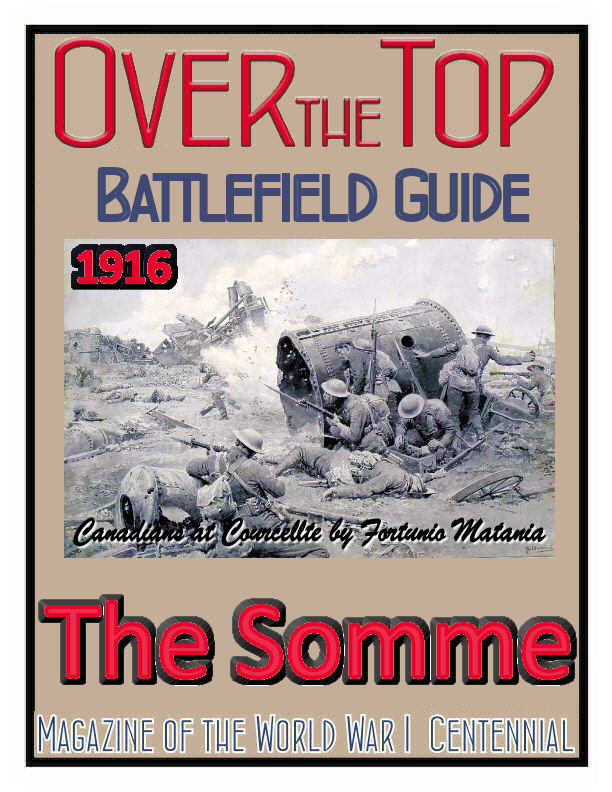 From then on the German attacks were more and more diverted from Verdun by the vast French�British attack at the Somme. In Verdun, another offensive led by General Mangin managed to recapture Thiaumont and Douaumont along with 6,000 prisoners by 24 October. Fort Vaux was reoccupied a week later. By 15 December the offensive freed Louvement and Bezonvaux villages and 11,000 more German soldiers surrendered. The line was now pushed back 5 km from the German's extreme advance of July. 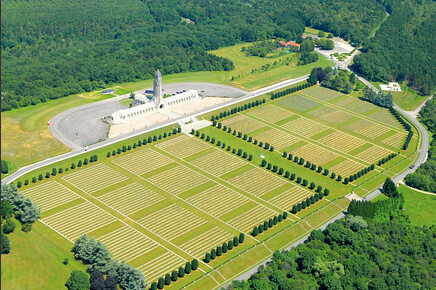 Aftermath: The result in terms of human lives of the battle of Verdun was appalling: by the most conservative estimate, 377,000 French and 337,000 Germans were killed, wounded, or disappeared. It is only in September and October 1918 that the whole of the territory lost after 21 February 1916 was reconquered thanks to the great commitment of the American troops. Rooms are still available. Book soon, though. Was 1916 the "Point of No Return"? 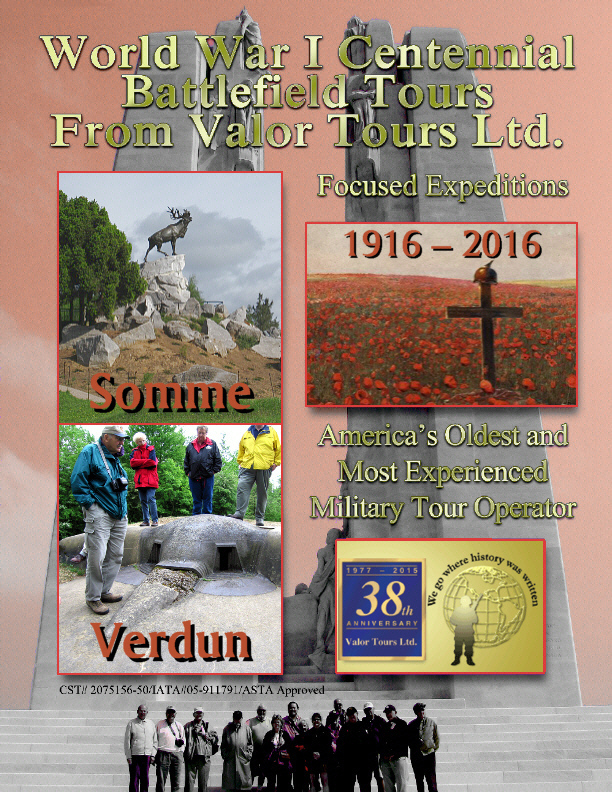 Over the years, I have received many requests from readers who want to visit the battlefields of the Western Front. As I was preparing the guidebooks for my 2016 groups that will be visiting Verdun and the Somme battlefields to study them in depth, I realized these would be perfect for independent visitors to Europe. So, in slightly modified versions I am making my trip guidebooks available to our readers. There are two ways to pay for the guides. Either way: Be sure to include your email address for delivery. The first German naval raid of the First World War in home waters took place on 3 November 1914, when a German squadron fired on the Coast Guard gunboat Halcyon as she was patrolling the seas north of Lowestoft on Great Britain's east coast. The enemy warships targeted Great Yarmouth without causing damage, but the rearmost German cruiser threw out mines that led to the sinking of a British submarine and the loss of most of her crew. After that attack, East Anglia�s coastal defenses were strengthened, but in April 1916, Lowestoft and Yarmouth were targeted again — and this time the enemy was more successful. The Lowestoft Raid of 24-25 April 1916 saw elements of the German High Seas Fleet bombard the east coast port of Lowestoft and threaten Yarmouth. The Germans took advantage of the distribution of the British fleet, which saw the battleships of the Grand Fleet based at Scapa Flow and the battlecruisers at Rosyth. Only weaker British squadrons were based farther south. On 24 April the entire German High Seas Fleet came out to sea. The German force contained 22 capital ships (battleships and battlecruisers), five older battleships, 12 light cruisers, and 48 destroyers under the command of Admiral Scheer. The actual raiding force was made up of the 1st Scouting Group (four battlecruisers), the 2nd Scouting Group (four cruisers), and two fast destroyer flotillas led by cruisers, all under Admiral Boedicker. The Zeebrugge force also provided U-boat support. The Germans allowed 30 minutes for the bombardment before the battlecruisers would have to retire. 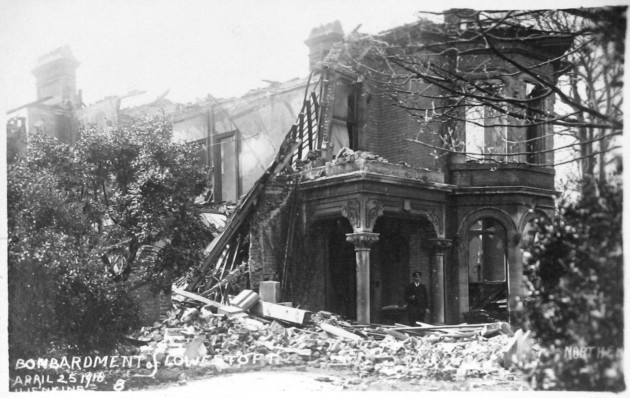 The enemy shelled Great Yarmouth for only a few minutes and the town escaped with little damage. The shoals (sand banks) had forced the battle cruisers to keep farther out to sea and the visibility was so poor that only one German dreadnought continued to fire on the town after the first salvo. However, Lowestoft had already taken a battering from Kaiser Wilhelm II�s navy, having been targeted some 20 minutes earlier. Four battlecruisers opened fire on the town at 4:11 a.m., aiming for the harbor works and swing bridges. About 200 houses were damaged and 40 destroyed during the 20-minute bombardment, and the South Pier Pavilion, which had been requisitioned as the headquarters of Commodore Ellison, was also hit. But, mercifully, there were very few casualties. The Royal Navy was aware that a major operation was under way, but bad weather inhibited efforts to interdict the assault. 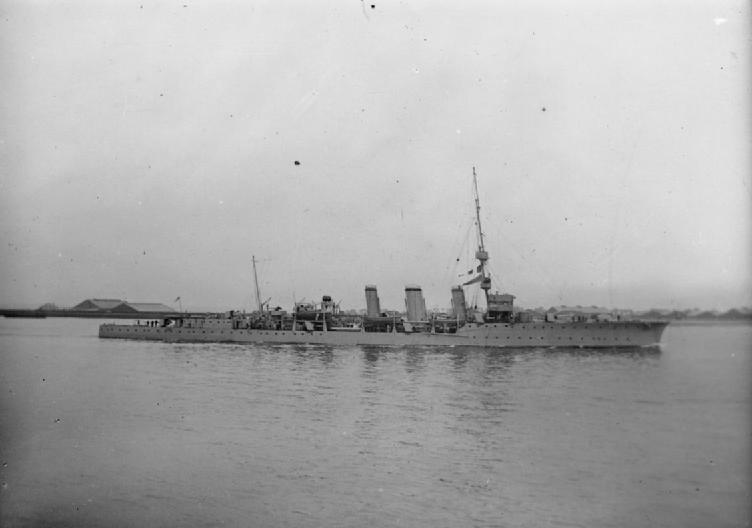 The only effective British response came from Commodore Tyrwhitt�s 5th Light Cruiser Squadron, supported by two destroyer flotillas. At first it was unclear what the German target was – a particularly alarming possibility was that they might try to break into the Downs, where 100 merchant ships were waiting to enter the Port of London. Once Tyrwhitt was at sea it became more obvious where the Germans were heading, so he turned north to protect the British bases at Lowestoft and Great Yarmouth. The naval action that ensued featured the smaller British ships engaging the German battlecrusiers at great disadvantage and being brushed aside. Nevertheless, the opposition was sufficient to force the battlecruiser force to withdraw. The people poured out of Lowestoft. On Long Road they were so thick I had to get off my bike and walk. Shells were falling on both sides of the road. . . Some of the fleeing people went as far as Bungay. Hundreds of people continued to leave Lowestoft every night to sleep in Carlton, occupying every shed and empty barn. After the 1916 raid, East Anglia�s defenses were further strengthened, with pillboxes built along the coast and batteries of field guns positioned at Caister, Corton, and Pakefield. To protect the approach to Great Yarmouth harbor, a naval gun was installed on Gorleston cliffs, and the monitor HMS Havelock and the gunboat HMS Glowworm were sent to Lowestoft.